With the arrival of our baby, my wife and I found that traveling had indeed gotten a lot harder. Long car trips were not so pleasant. So we determined to get a camper as a portable rest stop, and of course for its more traditional duties. My parents have a Lance camper, which we've used as a guest room. It was impressive enough that I decided that a Lance was my first choice, but we were not in the market for new. What I found was an ill-treated camper that could use some work, but the price was right. The one thing I was on the lookout for was bad smells, since to me that's a deal breaker. But I could smell nothing bad, just some disinfectant. So my wife has a look, and we agree that the work it'll take to bring up to scratch is reasonable. We went away and thought about it, and kept looking, for a week or so, and then went back to purchase it. Now, my wife thinks I am a terrible negotiator, so I told her then that she should get it. Fine. But her opening offer was their asking price! They said "OK." Nice job, honey. (There was some confusion as they had it packaged with the ratty Ford it was sitting on, but we already knew it was only adding $1000 to their price, and the negotiation was for the camper sans truck.) Later, however, it turned out that the refrigerator didn't work, so they knocked $500 off of the price. The final price wasn't bad, but certainly could have been better. We used the camper over Christmas, and it worked fine for us. But as the weather warmed up, its smell-free status began to change. A terrible urine smell began to waft out from everywhere. Some sleuthing revealed that it appears that this camper had been used as a rabbit hutch, as I found both rabbit food and, well, processed rabbit food under the table's pedestal. Certainly urine had soaked into the wood all along the edges of the camper's aisle. So our good deal turns out to be no good deal at all, and a lot of work to clean up. To add to the fun, when I went to re-tighten the jack mounting points I found that the wood in the dinette corner was all rotten from a leaky roof! A major reconstruction is underway. I tore the corner off of the camper and replaced the worst of the rotten wood. What remained (and was impossible to get to without truly tearing the camper down to its component parts) was treated with an epoxy compound designed to strengthen rotten wood. I then replaced the siding and re-sealed the roof. I tore out the dinette and the step over the water tank, as these were impregnated with nastiness. I cut the bottom several inches off of the dinette's divider wall for the same reason. The walls/floor were then washed with a pressure washer, and soaked with very strong bleach, let dry, and then lightly rinsed. Once dry, several coats of Kilz oil-based primer were used to seal the bottom foot or so of the woodwork. 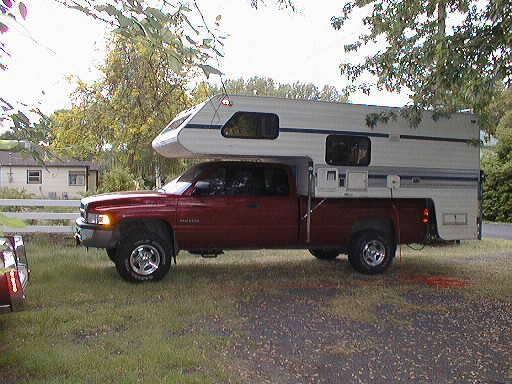 All this was done by Memorial Day, when we wanted to use the camper for a trip (depicted above). We did so, even in its partially disassembled state, and were fairly happy with things. The cleanup seems to have worked, and now we'll begin reconstruction. I have to build new seats for the dinette, a new step over the water tank, and build a new wall bottom. We also plan to lay new vinyl flooring, and my wife will do the finish painting. With luck, we'll have it all completed before our next trip. Even then, though, we probably won't have the plumbing working, as it leaks under pressure. A very belated log of its life with us. Center of Gravity (Wet) 53"